The purpose of this topic is to survey for what are people's preferred priority with camp structure. 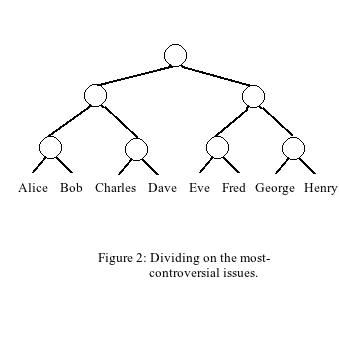 Currently, most topics operate where the doctrines with the most consensus for what is most important are pushed towards the top, or the root of a topic. The lesser agreeable doctrines are pushed towards the leaves and potentially being split across multiple branches. The structure which results from this tends to be like that portrayed in figure one, below. 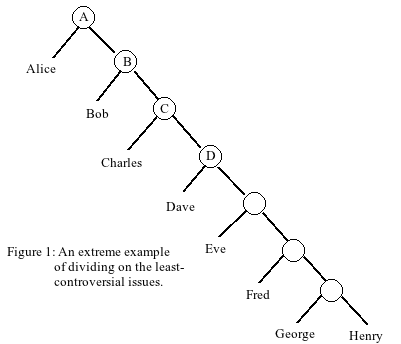 Figure 2 illustrates an alternative possibility pushing splits on more controversial doctrines higher in the tree. This illustrated the more flat structure that results. Note: Both rules can be used in survey topics at canonizer.com. Which is to be used in which survey topics can be specified in the root or agreement camp. Since most camps currently push towards Fig 1 structure, it is specified that for this particular camp, for demonstration purposes, the camps be structured according to Figure 2.